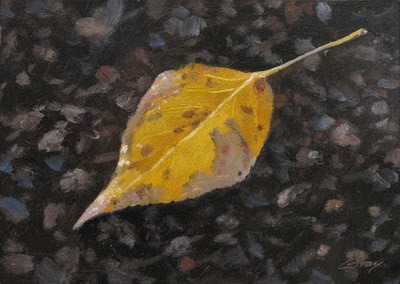 This beautifully mottled Cottonwood leaf laying on the gravel roadway seemed to sum up the season with great simplicity. how can something so mundane in this season capture so much? just beautiful. r.
Thought first, this leaf is swimming on clear water streaming... Beautyful *Memento mori*! RUDHI, thank you. Yes, it could almost be floating on water. The gravel was wet, so very dark. Thanks for sharing this beautiful painting! Reminds me of my childhood days! Thanks, Cedar--glad it taps good memories.